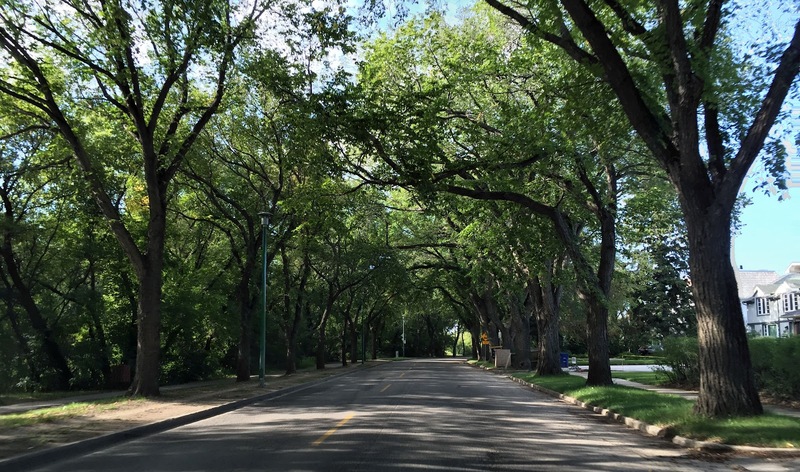 Day 10: Saskatoon, SK, to Edmonton, AB. 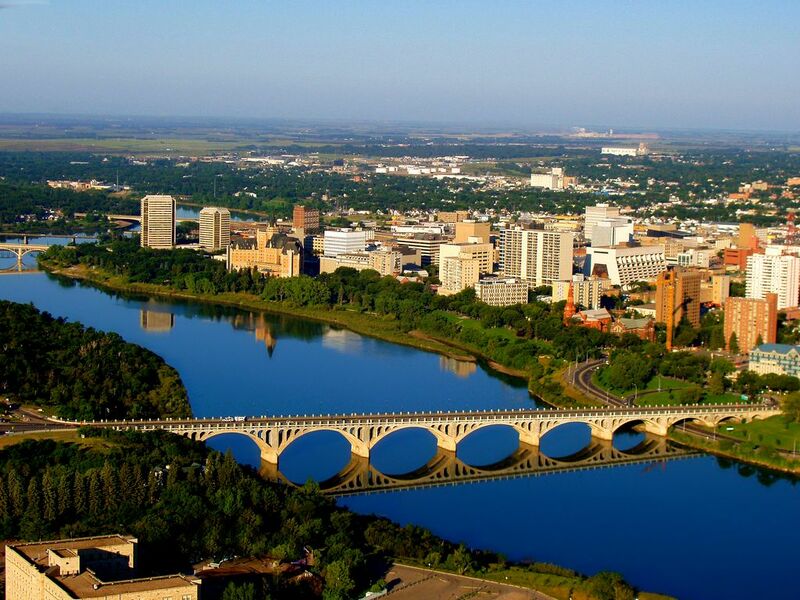 Sitting astride the South Saskatchewan River, Saskatoon is known as the City of Bridges. Before we left town, this morning, we wanted to check out the University Bridge that spans the river from 25th Street to the University of Saskatchewan and that features prominently in iconic photos of the city skyline. Built in 1916 when the city’s population was just over 20,000, the bridge today is a major artery in the commuter traffic between the eastern and western halves of the city. In our search for a good vantage point to get a photo of the bridge, we found ourselves at Kiwanis Memorial Park on the western bank of the river—the very park where we knew two letterboxes were hidden. We found the Happy Duck box first, but, alas, a radical pruning had befallen the juniper where the University Bridge box had been concealed, and the letterbox was no more. It was mid-morning before we left Saskatoon turning west on Highway 14 toward Edmonton. Like yesterday, an abundance of billowy clouds in shades of slate and gunmetal adorned the sky. With the profusion of wildflowers in bloom and a rich tapestry of mixed prairie grasses, this was indeed a scenic route—though AAA hadn’t given its official endorsement. A little later we were driving through the Mosquito First Nation reserve when we saw a black cow crossing the road ahead. 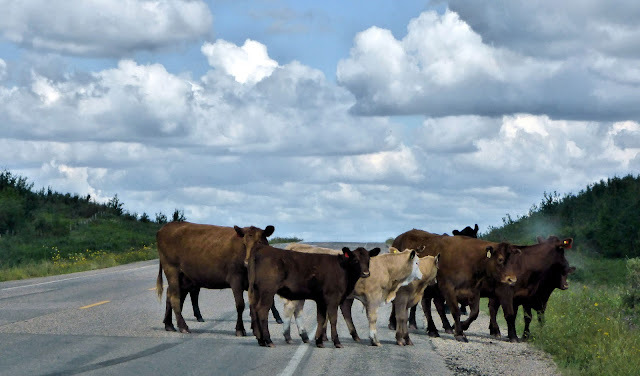 Modern cowpokes in 4x4 pickups were attempting unsuccessfully to nudge her back to the west side of the road where a dozen of her comrades stood watching. Suddenly the rest of the herd decided they also preferred the east side and transferred locations. A young bull was the only hold-out on the west, and while he stood pondering what to do now that all the women had abandoned the escape adventure, we took the opening and drove past, continuing on our way. About 20 miles north of Battleford on Highway 16, we had suddenly entered oil country. Black storage tanks popped up at regular intervals 150 yards from the highway on both sides. Production facilities came next with trains tugging tankers filled with Canadian oil. 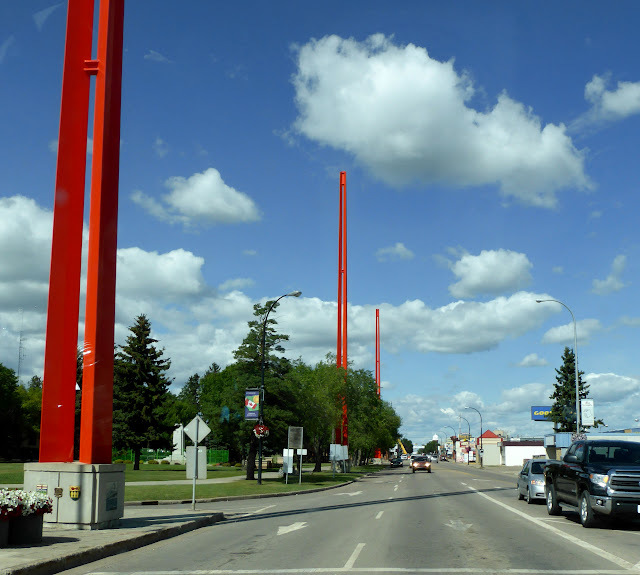 Oversized red survey markers tower over Highway 17, which runs along the provincial border in Lloydminster. In Lloydminster (pop. 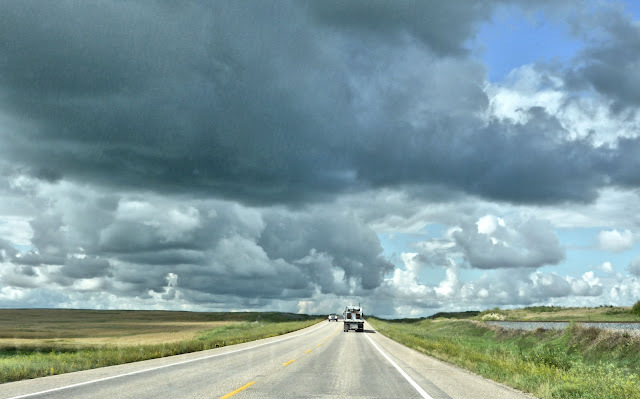 31,483), we entered the province of Alberta in the center of town. Another temperance settlement in the British Utopian style, Lloydminster was founded in 1903 when the area was still part of the Northwest Territories. Two years later when the provinces of Alberta and Saskatchewan were carved out of the southeastern portion of the NWT, the border between the two new provinces was established along the meridian at 110° W longitude, which happened to run slap through the middle of Lloydminster. 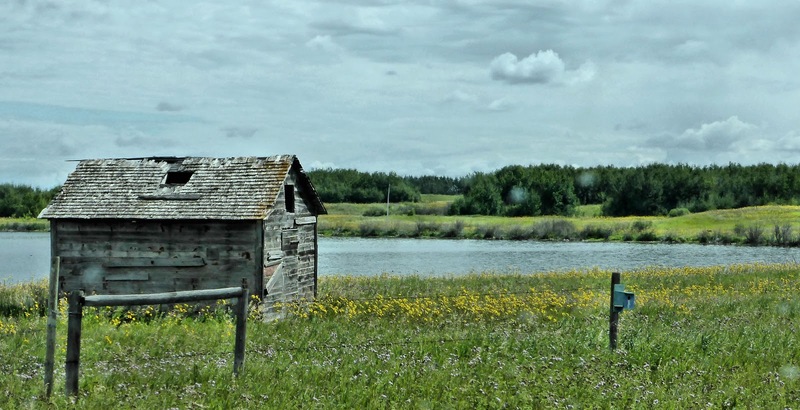 Appeals to dogleg the border around the city to put the entire town in Saskatchewan fell on deaf ears. For the next 25 years, Lloydminster existed as two separate towns, much like Texarkana, AR and Texarkana, TX. 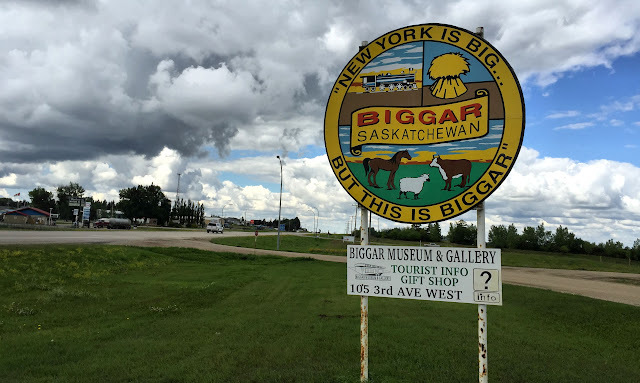 But the residents had never been happy with their town divided and persuaded the provincial governments to allow their amalgamation into a united bi-provincial city in 1930. We had no problem finding this Easter egg. 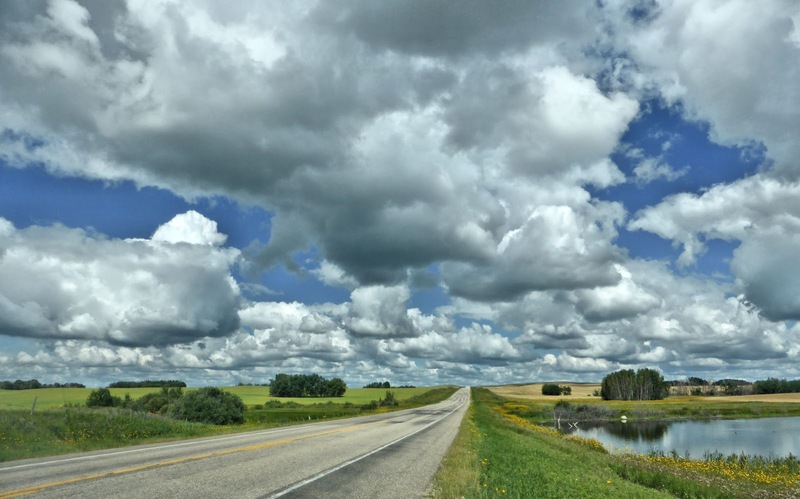 Halfway from Lloydminster to Edmonton, we broke up the last 150-mile leg with a stop in Vegreville (pop. 5,717), the center of eastern Alberta’s sizeable Ukranian minority. 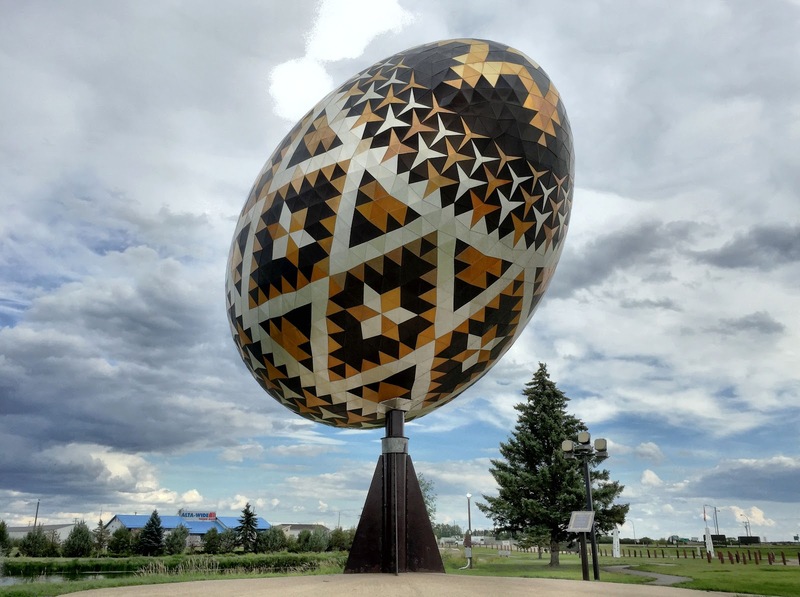 In honor of the Royal Canadian Mounted Police’s centennial, local citizens created a 25-ft aluminum egg decorated with a bronze, gold and silver design reflecting Ukranian folk art. The project was a monument to the protection the RCMP provided to the struggling early Ukranian settlers. As a little bonus for us, there was a letterbox nearby. Quirky roadside attraction + letterbox—priceless. From there, we finished our route into Edmonton, driving just north of the downtown at rush hour in about 25 minutes. Try doing that in Atlanta! After a surprisingly excellent dinner in the hotel restaurant, we settled into our room at the Doubletree and began making plans for what to do and see in Edmonton. Many fence posts are outfitted with bluebird houses. Clouds were so low it seemed you could reach up and touch them.